Invisalign Aligners are an innovative new ‘invisble brace’ system which incorporates a series of custom-made clear plastic aligners. Made from thin, clear, medical grade plastic the aligners fit snuggly onto your teeth and are virtually invisible so no-one will even notice that you are wearing them. Suitable for use on both top and bottom teeth they are ideal for small and large issues. What Is Involved With Invisalign Treatment? If confirmed that you're suitable for treatment, you'll receive a set of custom made aligners which will need to be worn for two weekly increments. Length of treatment differs but can range anywhere between 6 months and 2 years. Average treatment time is around 12-18 months. Unlike traditional braces Invisalign doesnt have any metal wires or brackets which can cause discomfort. Invisalign aligners are custom made smooth, clear material using transparent polycrystalline alumina that was incidentally designed by NASA. 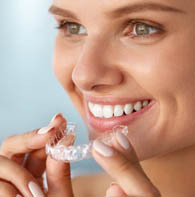 Invisalign is no more uncomfortable than any other straightening treatment- all of which can occasionally cause discomfort- particularly at the start of a new stage in treatment. In fact, the lack of metal wires and brackets actually means the aligners are more comfortable.